Since 2013, economic and trade relations between China and Europe have grown significantly. In this article, the authors look beyond conventional economic indicators, like trade, and political issues, like human rights, instead focusing on transport infrastructure, real estate and tourism to show that a new page is unfolding in the history of China-Europe relations. China and Europe have been closely linked since the Opium Wars, but the relative economic positions and power have reversed. Nothing illustrates this more symbolically than a stroll along the Bund in Shanghai: the low rise and old European-style buildings on the West side of the Huangpu River are dwarfed and eclipsed by the sparkling skyscrapers in Pudong on the east bank. The built environment of Shanghai, with its historic European-style buildings and modern China-built skyscrapers, is a physical manifestation of the reconfigured dynamic between China and Europe. Since 2013, China’s connections with Europe have expanded since developing its official policy of building a westward economic corridor — a new Silk Road — along its ancient route. Most recently, in December 2014, China agreed with Hungary, Serbia, and Macedonia to build a rail link between Budapest and Belgrade, which will be financed by Chinese companies and completed by 2017. This rail line will then be connected to the Macedonian capital of Skopje and the Greek port city of Piraeus where COSCO, the Chinese shipping giant, operates two piers for container units. While the linked land-sea project will strengthen cross-border transport between Central and Southeastern Europe by reducing train travel times between Budapest and Belgrade from eight to three hours, it really is designed to enlarge and accelerate the movement of goods between China and Europe. Having grown fivefold since 2003, trade between China and Europe reached $559 billion in 2013, solidifying the EU as China’s largest trading partner for the past 10 years. While the EU has invested more in China than the latter’s direct investment in the former, a US consulting company expects the EU to attract $250-500 billion more Chinese direct investment by 2020.1 A scenario likely to occur in the next few years is that China will invest more in Europe, instead of vice versa. This will be another telling sign that fortune and power are shifting in China’s favour. These developments are not isolated and random. They represent a new structure of interactions between the older European economies and a rising Chinese power. We can understand this structure well by examining its conventional macroeconomic dimensions of bilateral trade and investment. In this essay, however, we make better sense of the new China-Europe relationship through a set of less used lenses: transport infrastructure, real estate, and tourism. They offer new insights into areas where China exerts a large and heavy footprint in Europe, via official channels and from the ground up. In thinking about China and Europe today, transport infrastructure does not usually come to mind due to the long distance between them and Europe’s own well connected transport networks. Having built the world’s longest highway, railway, and more bridges and buildings than any other country over the past two decades, China has been constructing an extensive transport and municipal infrastructure within its Asian neighbours and far-flung African cities.2 More recently, China has also turned to Europe in strengthening their long-distance transport connections, aiming to improve the overland movement of traded goods. Less expected is China’s new foray into the domestic infrastructure sector of a few European countries. Both moves make infrastructure a major avenue for China to forge direct physical connections to Europe. The most important connection thus far is the Trans-Eurasia railroad from the city of Chongqing in southwestern China to Duisburg, Germany. Launched into operation in 2011 by a joint venture with Germany, China, Kazakhstan, and Russia, the 11,179-kilometre rail line snakes through six countries including Belarus and Poland (see Figure 1). China is the largest beneficiary of this freight-focused rail network, having already shipped $2.5 billion worth of goods on this route to Europe since 2011. 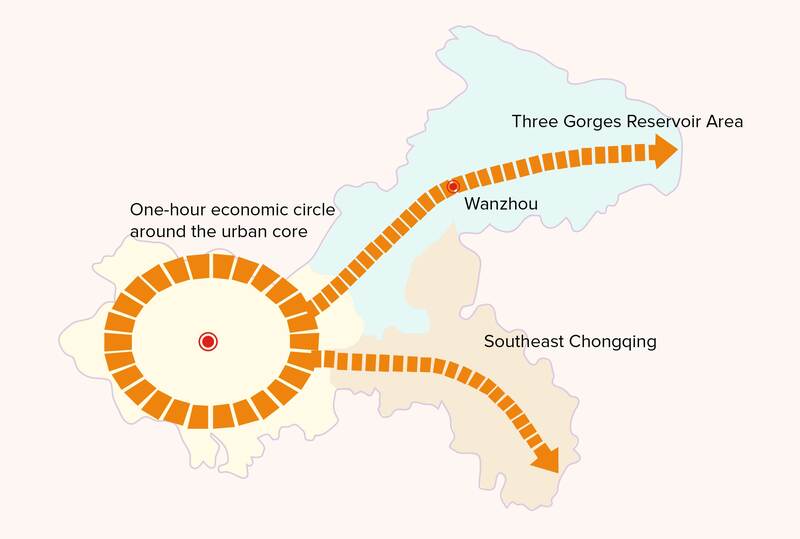 As labour and land costs in coastal cities like Shanghai and Shenzhen have gone up, the Chinese government has been pushing and inducing foreign investors and domestic producers to move inland through its “Go West” policy. 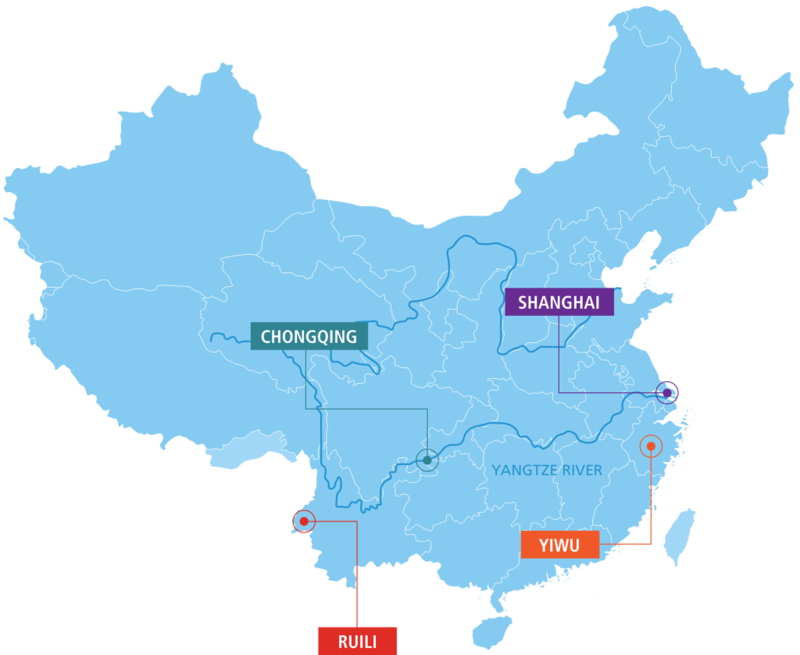 Interior megacities like Chongqing and Chengdu have been booming as major destinations for large new manufacturing projects. Having set up what would be Asia’s largest laptop factory in Chongqing, US computer giant Hewlett Packard has already shipped more than four million notebook computers to Europe by the Chongqing-Duisburg rail since 2011. While this overland rail route can yield major economic benefits for China and Europe, its greater potential won’t be realised without policies for overcoming existing barriers. The Chinese government has recently approved the status of an international land port for Chengdu and Chongqing. 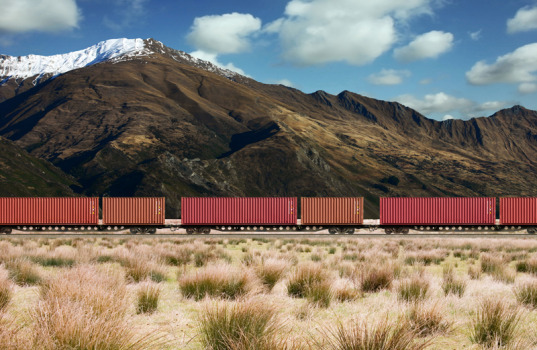 This allows the direct and full import of European meats and cars to fill the train cars going back to China that would otherwise only be partially filled after carrying full loads of exported electronic products to the European markets. A fully loaded train has recently brought car parts from Germany to a Ford plant in Chongqing using the Trans-Eurasia railroad. As China’s rail transport connections to Europe multiply, China has also launched an infrastructure build-up within Europe with an initial focus on the geographically closer and economically weaker Central and Eastern Europe. In December 2014, China and Serbia inaugurated the first ever bridge in Europe across the Danube River financed and built by China. Named after Mihajlo Pupin, a renowned Serbian scientist, the 1,500-metre bridge connects the southern industrial district of Zemun with the northern residential area of Borca in Belgrade, cutting the travel time across the Danube from more than one hour to just 10 minutes. China has also landed the contracts for the Stanari Thermal Power Plant in Bosnia (up to $1.7 billion) and the Bar-Boljare motorway in Montenegro with a link to Serbia ($984 million).6 Infrastructure projects of this scale have been very rare in these countries for more than 20 years, given the bad economic conditions in Croatia, Serbia, and Bosnia-Herzegovina, with nearly 1.5 million unemployed, due to the post-Yugoslavian political instability, ethnic conflicts, and natural disasters like flooding. China’s major efforts to finance and upgrade the outdated transport and municipal infrastructure in these countries opens up a new era of China’s local presence and influence in Europe. As China is making inroads into Europe’s infrastructure sector, the real estate sector cannot be far behind as an investment target. Southern European countries like Italy and Portugal, which have been adversely affected by the financial crisis, are seen as especially good opportunities for Chinese investors, as the property prices there are lower than in other European countries, like the United Kingdom and France, that have managed to weather the crisis better. Homes in southern Europe are also attractive compared with those of China as 300,000 euros buys a 200 square metre villa facing the sea. That amount only buys an apartment of 68 square metres in central Shanghai7 where property prices have been artificially inflated due to years of speculative supply and persistently strong demand. The scope of Chinese investment in European property represents a powerful combination of China’s surplus corporate and private capital that can affect the urban landscape in European cities. Its long-term impact, however, will depend on the pace and volume of its outflow from China, and its geographical concentration and spread within Europe. As a relatively small but growing number of wealthy Chinese investors put their money into European real estate, a much larger number of middle and upper middle class tourists from China are coming to Europe to buy a lot of luxury goods. China’s rapid economic growth has created a huge number of middle and upper middle class consumers with insatiable desire and startling purchasing power. In 2013, Chinese citizens made approximately 100 million overseas trips and spent over $100 billion on their trips, mostly on luxury goods, overtaking the United States and Germany as the world’s number one tourist spending nation. Today nearly one-third of the world’s personal luxury goods are bought by Chinese consumers. In 2014, Europe accounted for 3.5% of overseas travel destinations for Chinese citizens; this was the second most popular regional destination after Asia, which accounted for 70.4% of overseas tourism. Visa applications to enter the Schengen Area from China accounted for approximately 1.5 million of the total applications in 2013, ranking China third overall, behind Russia and Ukraine.14 In its 2014 report, hotels.com observed that “European destinations are the most popular amongst Chinese travellers in terms of places they wish to visit in the next 12 months.” By surveying the number of rooms and the length of stay in hotels booked through its website, hotels.com placed France, the United Kingdom, and Italy in the top ten destinations for Chinese travellers in 2013 as all three countries experienced growth in the amount of tourism from China.15The German National Tourist Board recently showed Germany, France, Italy, and Switzerland as the top four European destinations for Chinese tourists. While many Chinese tourists in Europe are interested in seeing sites of historical interest and established landmarks like the Eiffel Tower and Venice’s Grand Canal, they are there for a much more passionate interest: shopping, especially for brand-name and luxury goods. Paris is the most popular destination for this shopping spree. It is where Chinese tourists head to the Louis Vuitton shops in much larger numbers than to the Louvre. As early as 2009, Chinese tourists overtook Russians as the highest spending visitors to France. Wealthy Chinese tourists also head south to the wine country of Bordeaux where they snap up expensive wine, paying as much as $800 for a bottle.16 They bring the wine back to China where it can be displayed and then drunk as a prized possession; red wine has become increasingly popular at dinner parties, replacing beer and traditional Chinese liquor. McKinsey’s survey of Chinese luxury consumers in 2012 found that “Europe is growing in appeal among Chinese luxury consumers, with about one-fifth of them reporting this year that their most recent overseas purchases occurred in a European city. That is more than double the European share two years ago.”17 A study by the European Travel Commission estimated that Chinese tourists reserve more than a third of their trip budgets for shopping. To be able to do so, they compromise on eating and sleeping. A survey in 2006 found that Chinese travellers in Europe had eaten “European food” only once, and 10% not at all. Many in tour groups arranged by Chinese travel agencies would stay in cheaper hotels and eat instant noodles, even though they could afford luxurious hotels and lavish meals.18 The average Chinese tourist spends around $5,000 during a European trip, more than any other country. This is not surprising when one often sees groups of Chinese tourists getting dropped off at expensive stores and coming out with their suitcases full of brand name clothes, handbags, and cosmetics. There are several reasons for Chinese tourists to buy luxury goods heavily in Europe. Besides the obvious factor of their rising affluence, Chinese tourists pay less for luxury consumption in Europe than in China. Taxes on certain items and tariffs on imported goods increase the price of luxury goods produced elsewhere and sold in China. According to The Economist, taxes and tariffs can increase prices in China to 50% more than a shopper would pay elsewhere. For example, a Louis Vuitton handbag costs 30% more in Beijing than in Paris.19 The purchase of luxury goods while travelling in Europe connotes the high income and status of the consumer. A study published by the University of Pennsylvania’s Wharton Business School found that “travelling has become part of the luxury lifestyle in China and is considered a status symbol: there is greater cachet in being able to say you purchased your bag at the place of origin in Paris rather than a branch in Tianjin.”20 Chinese consumers also perceive a higher quality and a greater variety of luxury goods if bought in the places of origin. In addition, while the appreciation of the Chinese yuan against the euro has helped, Chinese tourists have benefited from a greater ease in getting European visas. European countries have made getting visas easier for Chinese tourists. Recent initiatives include changes in the visa process for tourists wishing to visit the Schengen area. Visa applications can be submitted up to six months in advance instead of three, allowing people to plan their trips earlier, and travel medical insurance is no longer required. The time it takes to process applications from China has been reduced. When Chinese Premier Li Keqiang visited Germany in October 2014, the two sides agreed to reduce the visa application process from between three and five working days to 48 hours for Chinese tourists. The French embassy in China also shortened its visa processing time for Chinese visitors to 48 hours and simplified the application documents. Italy has already cut its visa approval for Chinese tourists to 36 hours. The United Kingdom has recently introduced the 24-hour Super Priority Visa service in Beijing, Shanghai, and Guangzhou. With 12 visa application centres across China now, the United Kingdom issued more than 320,000 visas to Chinese tourists during January-August 2014, the highest number ever.21 This competitive rush of European countries to simplify and speed up visa applications for high spending Chinese tourists will help boost their sluggish economies. The sum of Chinese investment and spending in Europe’s infrastructure, real estate, and tourism sectors amounts to a huge influx of money that reflects the changed economic positions of China and Europe and their long-distance connections. Many may see this as the relative decline of Europe and the continuing rise of China that implies a reversal of power and fortune. But there is both change and continuity to the new China-Europe relationship that makes it more complex than a one-way flow of surplus Chinese money. In 2013, the EU invested $6.5 billion in China, up 21.9% from 2012, which doubled China’s $3.6 billion in the other direction, an increase of only 6.2%. While this sustains the earlier pattern of bilateral investment, individual European countries have taken more differentiated economic approaches in dealing with China. Through the agreement between the Bank of England and the People’s Bank of China to clear and settle Chinese currency in London, the British government has gone ahead of most other European countries in making London the leading hub for trade with China. By the end of 2013, China’s cumulative investment in the United Kingdom reached $32 billion, far exceeding the $18 billion the other way around.22 Not to be left behind, Switzerland’s central bank joined its Chinese counterpart in January 2015, making Zurich Europe’s newest hub for trading the Chinese currency (RMB). As the China-Europe economic relationship becomes stronger, it has become more varied and specific to individual countries. 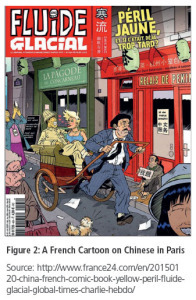 The uneven penetration of China’s economic influence has begun to generate a sort of cultural backlash, which is illustrated by a recent cartoon that made the cover of Fluide Glacial, a French monthly comic book (see Figure 2). Despite an underlying negative headline of “Yellow Peril: What if it is too late?” the restaurant window shows a harmless sign: “Chinese spoken here.” But the joke is a man bearing the words “I am hungry” sitting at the door of a restaurant that advertises steamed Chinese dumplings with a French twist: the addition of béarnaise sauce. Adding to the insult is a Frenchman pulling a rickshaw that carries a Chinese man in traditional high-class clothing with a blonde European woman. The humour aside, this cartoon reveals an unfavourable view of China, or at least its economic wealth in Paris and in Europe. It immediately drew a harsh response from The Global Times, a Chinese daily with close links to the government, saying that the French magazine possibly attempted to gain attention by following Charlie Hebdo whose Paris offices were savagely attacked by Islamist gunmen on January 7, 2015. This media episode matters little to the massive scope of China-Europe interactions. When we look beyond conventional economic indicators like trade and political issues like human rights as in this article, we see a new page unfolding in the history of China-Europe relations. While it features continued bilateral official policies that have led to new infrastructure deals, bottom-up activities in real estate investment and tourism have become more prominent. With the Trans-Eurasia railroad already in operation and millions of Chinese tourists moving around Europe, China’s ancient dream of connecting to Europe via Central Asia along the old Silk Road has come true. Yet the new Silk Road envisioned by China for the 21st century is just beginning to take shape. Its full opportunities for both China and Europe are yet to come. This article was written by Xiangming Chen and Julia Mardeusz and originally published here in the European Financial Review on February 10, 2015. Xiangming Chen is the Dean and Director of the Center for Urban and Global Studies and Paul E. Raether Distinguished Professor of Global Urban Studies and Sociology at Trinity College, Connecticut, and a distinguished guest professor at Fudan University, Shanghai. He has published extensively on urbanisation and globalisation with a focus on China and Asia. His many books include Shanghai Rising: State Power and Local Transformations in a Global Megacity (University of Minnesota Press, 2009; Chinese Edition, 2009). Julia Mardeusz is currently a junior at Trinity College, Connecticut, majoring in Public Policy and Law. Her interests include American public policy and European politics and policy. She has been a student researcher at the Center for Urban and Global Studies at Trinity College since 2013 and studied in Paris during fall 2014. 1. Reported by The People’s Daily, June 23, 2014, p. 4. 2. 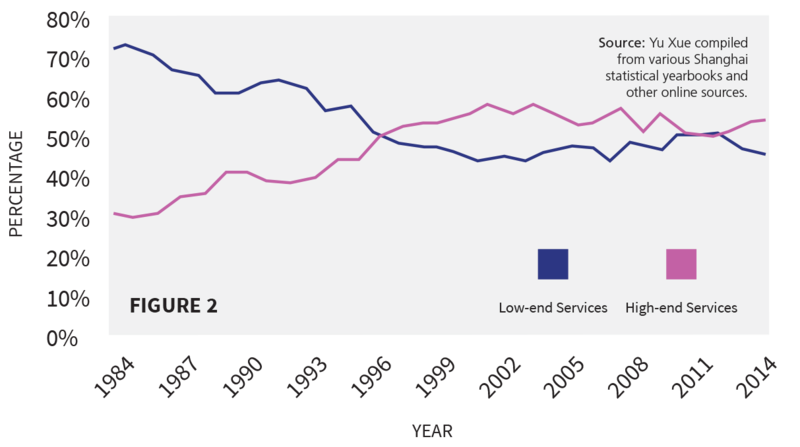 See Xiangming Chen and Curtis Stone, “China and Southeast Asia: Unbalanced Development in the Greater Mekong Subregion”, The European Financial Review (August 2013). pp. 7-11; Xiangming Chen and Garth Myers, “China and Africa: The Crucial Urban Connection”, The European Financial Review (December 2013). pp. 89-93. 3. “European meats are transported directly to Chengdu”, The People’s Daily, April 26, 2014, p. 6. 4. 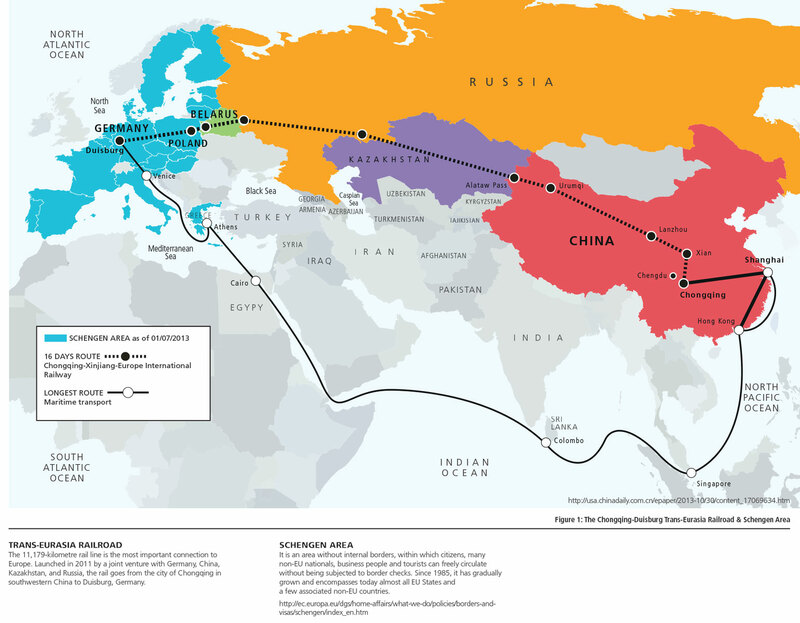 “’Silk Road’ railways link Europe and Asia”, The Gateway, CNN News, June 27, 2013; accessed from http://edition.cnn.com/2013/06/27/business/silk-railroad-trading-network/. 5. “The 100th China-Europe train this year has departed”, The People’s Daily, August 2, 2014, p. 1. 6. “Li forges new link in Serbian relations”, The China Daily, December 19, 2014, p. 1. 7. Henrique Almeida, “Needy EU nations woo Chinese home buyers to ease slump,” Bloomberg News; accessed from http://www.bloomberg.com/news/2013-08-21/needy-eu-nations-woo-chinese-home-buyers-to-ease-slump.html. 9. “Sale of a landmark skyscraper puts Spain on the map of Chinese investors”, The New York Times, September 23, 2014, p. B3. 10. Fu Yao, “A place in the sun”, NewsChina, February 2015, pp. 34-37. 11. Jamil Anderlini, “Chinese investors surged into the EU at height of debt crisis,” The Financial Times, October 6, 2014; access from http://www.ft.com/intl/cms/s/2/53b7a268-44a6-11e4-ab0c-00144feabdc0.html#axzz3NduHcZzt. 12. “Chinese developer envisions a future for abandoned London docks,” The New York Times, Business Section, February 19, 2014, pp. B1, B6. 14. National Tourism Administration of the People’s Republic of China, “European Countries Fight for Chinese Tourists”, accessed from http://en.cnta.gov.cn/html/2014-7/2014-7-3-9-57-70413.html. 15. Hotels.com, “Chinese international travel monitor 2014”, p. 21; accessed from http://press.hotels.com/content/themes/CITM/assets/pdf/CITM_UK_PDF_2014.pdf. 16. “A new grant tour”, The Economist, December 10, 2010, p. 114. 17. Atsmon, Yuval, Diane Ducarme, Max Magni, and Cathy Wu, Luxury Without Borders: China’s vNew Class of Shoppers Take on the World. The McKinsey Chinese Luxury Consumer Survey, McKinsey Insight China, December 2012; accessed from https://solutions.mckinsey.com/insightschina/. 19. “China’s addiction to luxury goods”, The Economist, April 29, 2014; accessed from http://www.economist.com/blogs/economist-explains/2014/04/economist-explains-17. 20. Knowledge@Wharton Blog, “Louis Vuitton and the traveling Chinese consumer”, Knowledge@Wharton, January 3, 2012; accessed from http://knowledge.wharton.upenn.edu/article/louis-vuitton-and-the-traveling-chinese-consumer/. 21. “European countries compete for Chinese tourists”, The China Daily, Travel Section, December 20-21, 2014, p. 19.22. Reported in The People’s Daily, June 20, 2014, p. 4. China is now the largest trading nation in the world with strong ties to Africa, Latin and America and the Middle East. This once impoverished and isolated nation has lifted several hundred millions of its own people out of poverty and is now reshaping the developing world. This article looks at China’s involvement in four developing regions to assess China’s influence as a rising global power. The China where the first author grew up through college in the early 1980s was the largest and one of the poorest developing countries. The China where the second author left to attend high school in the United States was about to pass Japan to become the world’s second largest economy, in 2010. Over the past three decades, China has lifted over 500 million of its people out of poverty. 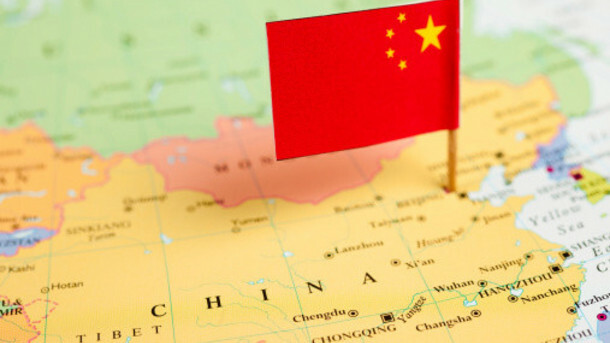 Globally, China has just surpassed the United States to become the largest trading nation in the world and is expected to soon overtake the latter as the world’s largest economy (in terms of purchasing power parity or PPP). 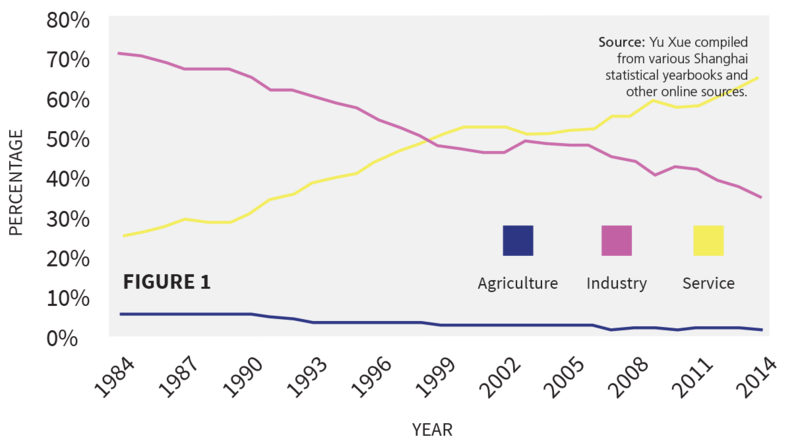 More importantly regarding the focus of this essay, China is now the largest trader and investor in Africa, with its footprints spreading and seeping into all corners of the developing world. How did the once impoverished and isolated “Third World” country become a powerful force in shaping a new developing world in the 21st century? What are the positive vs. negative consequences of China’s inroads into developing countries by exporting its urbanism to Africa, for example? These questions highlight China’s global impact that matters a great deal to the everyday life of millions of poor people in developing countries. 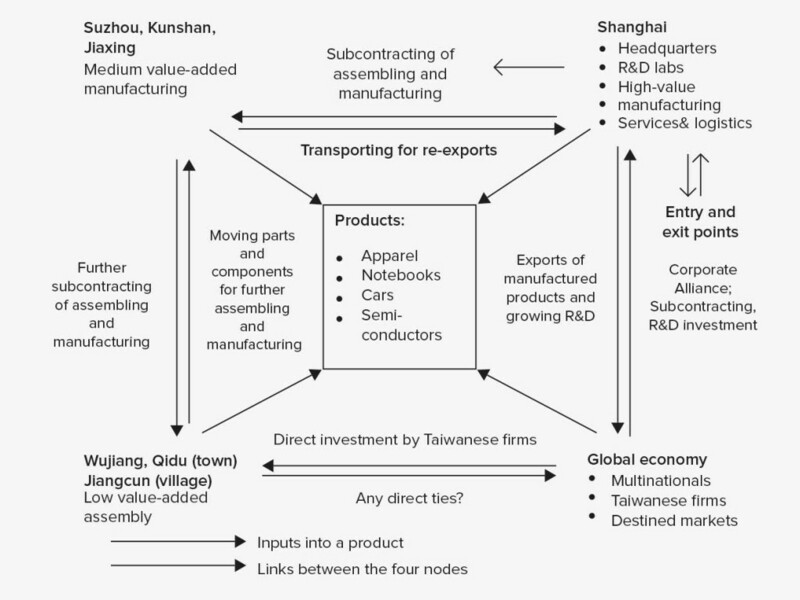 In this essay, following China’s global footprints in four developing regions, we offer a broad comparison of both the different and consistent economic impacts of China within and across these regions.1 Figure 1 shows China’s investment in energy and infrastructure in the four regions, while Figure 2 breaks China’s investment into four specific sectors of one major country in each of the four regions. Guided by these comparative data and focusing on four developing regions, we present a broad picture of China’s widespread but mixed role in developing countries, thus offering a preliminary assessment of whether China’s influence as a rising global power may differ from the traditional or established Western powers in how they approach the developing world. Back in the last decades of the 20th century, the drivers and role models for development in Asia and beyond were the “Four Tigers”: Hong Kong, Singapore, South Korea, and Taiwan. The onset of the 21st century began to position China toward the epicentre of the Asian economy, with its influence spreading across the continent through more trade, outward investment, and other outgoing initiatives such as cross-border infrastructure development. Compared to the other energy projects sponsored by China, the Central Asian vector of China’s energy policy has become more important due to the region’s abundance of oil and natural gas. While China sees Kazakhstan’s energy supply a key to its “Go West” program, Kazakhstan has used Sino-Kazakh cooperation to balance against Russia’s influence in its energy sector. China is also constructing a 1,800-kilometre natural gas pipeline from one of the world’s largest natural gas exporter, Turkmenistan, which benefits from doubling its energy supply to China and circumventing its biggest competitor – Russia. Beijing wins by securing new gas supplies and thus enlarging its already hefty investment in energy projects in Asia (see Figure 1). China’s unprecedented economic growth requires an increasing amount of oil to sustain it. In 2012, close to one-third of China’s total oil imports came from Africa, and China is looking to expand its energy presence in Africa. 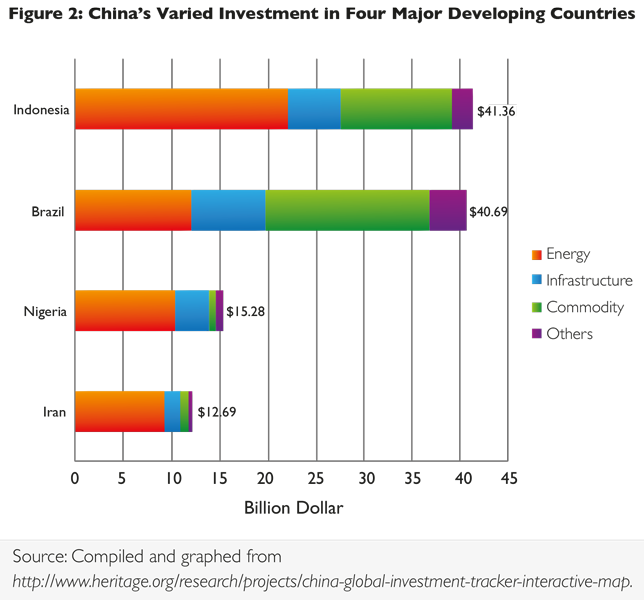 Nigeria has received the most Chinese direct investment over the past decade. While many Western energy firms are reluctant, China reached a $10 billion hydrocarbon deal with Nigeria at the beginning of 2014 (see Photo 1). In addition to exploiting crude oil and natural gas, China has been involved in constructing an additional refinery in Baro, Nigeria.7 Although critics have attributed China’s heavy footprint in Africa’s energy sector to its energy and resource demand back home, evidence suggests otherwise. China Africa Sunlight Energy Ltd. recently invested $2.1 billion in developing a 2,100-megawatt plant to help ease electricity shortages in Zimbabwe, which is only capable of generating 1,320 megawatts against a demand of 2,200 megawatts of electricity. “China Africa Sunlight Energy is looking at the possibility of pumping gas to the port city of Beira in neighbouring Mozambique, using an idle pipeline that the National Oil Co. of Zimbabwe once used to bring fuel into the country.”8 This power plant is expected to produce 300 megawatts by mid-2015, and the number is looking to double by the end of the year. While much of the media attention has focused on China’s investment in Africa’s energy sector, China is reshaping Africa’s landscape through large-scale infrastructure development. However, concerns arise on whether Africa is too dependent on China as results of “high commodity prices and investment inflows.”11 With China-Africa trade looking to hit $280 billion by 2015, some worry that African economies depend too much on China. Some urge African countries to diversify their economies and decrease their dependence on China. There are also calls for China to focus more on human rights and community engagement. As such a dominant investor in some African countries including those with an authoritarian government like Zimbabwe, China struggles to balance between the return on its huge investment, helping local development and living up to international norms of engagement. Ever since the 1960s, China has been providing limited development assistance to a small number of Latin American countries such as Chile. Fast-forward to the 21st century, China has considerably expanded its economic ties with Latin America through greater trade and more diverse investment. 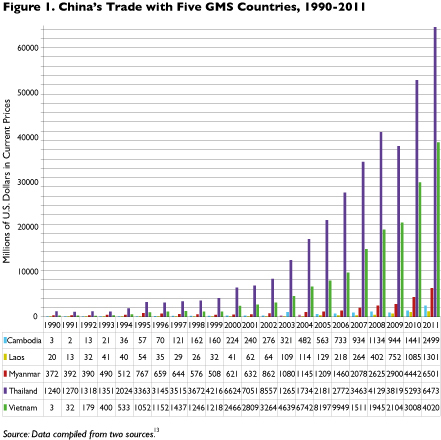 “Trade between China and Latin American countries has grown exponentially over the past decade. Although Sino-Latin American trade continues to remain a relatively small share of their respective global trade, growth has exceeded many expectations. From 2000 to 2009, annual trade between China and Latin American countries grew more than 1,200%, from $10 billion to $130 billion, according to the United Nations statistics.”12 In 2012, Latin America accounted for 13% of China’s total outbound investment – about $11.4 billion, a significant increase from the $120 million of 2004. Like in Asia and Africa, China has favored the energy sector in Latin America (see Figure 1), targeting Venezuela for its oil and Brazil for its hydropower. Of China’s $100 billion investment in Latin America since 2005, more than half has been energy and infrastructure related. 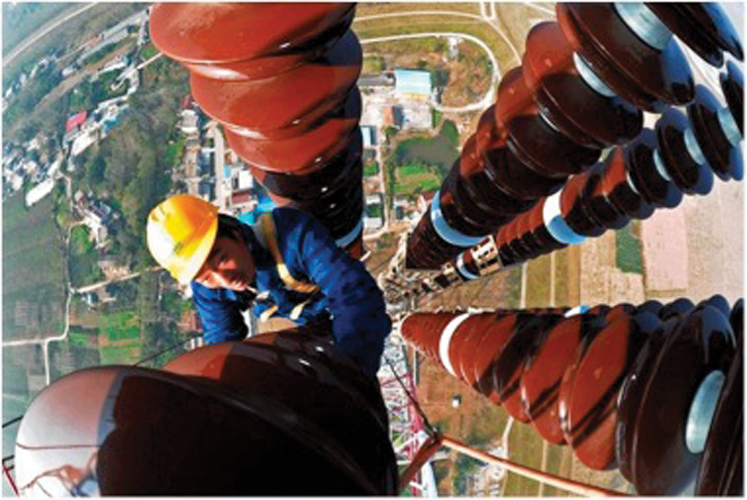 In 2010, China’s State Grid announced a $1 billion buyout of seven Brazilian power transmission companies. Two years later, in 2012, China’s State Grid was chosen by the Brazilian government to build a $440 million power-transmission project. And at the end of 2013, China’s State Grid led a group to win the rights building a $21 billion hydropower plant in Brazil. Set to become the world’s third-largest hydropower plant and take around 46 months to complete, it will also create a 2,092 km hydropower transmission line and two energy converter stations that will be able to take energy from the State of Pará, along the Xingu River in the Amazon Basin, to Brazil’s Southeast region, with a planned capacity of 11,233 megawatts. Brazil’s economic acceleration in the past decade led to a surge in the country’s energy demand. Given Brazil’s geographical endowment, as much as 80% of its total energy comes from hydropower generation.13 With power generation operating close to the limit, Brazil is urgently constructing more power plants using the Amazon’s abundant hydro resources and transmitting it to its Southeast region, especially Rio de Janeiro where much more energy is needed in light of the upcoming World Cup and Summer Olympics in 2016. To do so, Brazil has turned to China for its expertise and experience in building long-distance power transmission towers or the so-called electricity pylons (see Photo 2). Besides its growing economic presence in Latin America, China has made some cultural inroads as well. Since 2012, China has opened 32 new Confucius Institutes all over Latin America, a Chinese foreign ministry deputy announced. Hotels in the region have begun to prepare for the increasing number of Chinese tourists by making the menus available in Mandarin.14 This confirms the larger trend of more Chinese tourists going to developing countries beyond Asia and advanced economies in North America and Western Europe, making China the world’s number one tourist-sending nation in 2013 with approximately 100 million overseas trips. Tracing what China is doing in the conventionally defined developing world has taken us to Asia, Africa and Latin America. Yet given China’s huge demand for external energy, we are not surprised at all to see China’s growing presence in the Middle East, whose energy sector ranks second behind Asia in absorbing Chinese investment (see Figure 1). Despite China’s massive efforts to secure energy from Asia and Africa, as well as from Venezuela in Latin America, its dependency on Middle Eastern oil has risen over time. The Middle East is currently the largest exporter of crude oil to China. The share of oil imported by China from the Middle East was 48% in 1990, 49% in 2005, and 51% in 2011. It is expected that China’s crude oil imports from the Middle East will reach 70% by 2020 and continue to grow until 2035, according to the International Energy Agency. Saudi Arabia is China’s largest energy supplier with about one million barrels per day, accounting for 20% of China’s crude oil imports. Iran, another big oil supplier, contributes about 10% to China’s overall oil imports as well (see Figure 2). China has maintained a friendly relationship with both Saudi Arabia and Iran. A number of top Chinese leaders including Hu Jintao and the current president Xi Jinping have visited Saudi Arabia. And China has been dragging its feet on the UN sanctions against Iran.15 These diplomatic postures toward the Middle East conform to China’s pragmatic economic policies and interests in other energy- and commodity-rich regions such as Africa and Latin America. As many African countries have done, some Middle Eastern governments have brought Chinese contractors in to work on major infrastructure projects. Egypt has also partnered with China to develop its Suez special economic zone, a development strategy that China had used itself and promoted in Africa and the least developed parts of Southeast Asia like Laos. 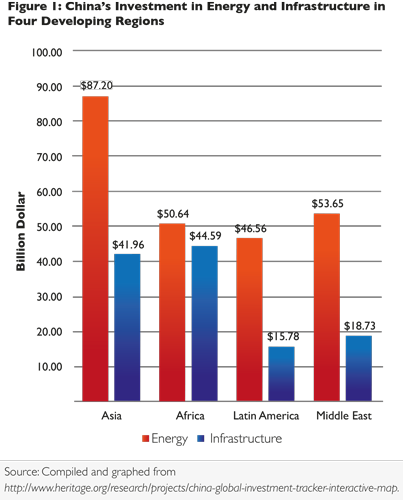 While China has diversified its investment in the Middle East, it is much more concentrated in the energy sector than in infrastructure (Figure 1). This further establishes China’s significant dependency on the Middle East for energy resources, namely oil. However, once we factor in the non-oil related Chinese economic activities, China’s footprint in the Middle East becomes somewhat similar to the large scope of China’s economic influence in the other three developing regions, especially in several major countries where China has moved beyond energy into infrastructure and commodities (see Figures 1 and 2). In this sense, the Middle East still marks the old destination for China’s new effort to revive the ancient Silk Road through Central Asia. Judging by a sampling of evidence across the four developing regions, we characterize China’s role as very ambitious and yet uncertain. The ambitious aspect is increasingly fueled by China’s abundant surplus capital in both private and public hands that may have a stronger effect on the urban landscape and transport infrastructure of developing countries than on its quest for the latter’s energy and commodities. It is again in Africa where the transport infrastructure is the poorest in the developing world that China is scaling up its investment most aggressively. On his recent four-country tour of Africa, Chinese Premier Li Keqiang committed to set aside $2 billion for an African Development Fund and promised his support for a high-speed rail network connecting African capitals. As a start, China Railway Construction Corporation made a $13.1 billion deal to build an 860-mile high-speed railway in Nigeria that would employ more than 4,000 workers during construction, and 5,000 more afterward.18 Claiming no-strings-attached, China’s ambitious effort can deviate from the precedent of Western colonial powers who had built highly limited transport infrastructure for shipping out their craved commodities from Africa. Yes it is uncertain that the Chinese will succeed where the earlier powers largely failed. The uncertain aspect of China’s strong role has also run into trouble in the Middle East. Despite China’s political advantage in taking a somewhat neutral position regarding Iran under West-imposed sanctions in order to continue buying its oil, Iran’s Ministry of Oil has recently removed China from the project to develop the South Azadegan oilfield because of long delays. This puts China’s non-political or no-strings-attached approach to dealing with developing countries, especially those with an authoritarian domestic system and a precarious international status, to test or at risk. While ambitious and already far-reaching and powerful, China’s role in reshaping the developing world will only grow and remain uncertain over time. It highlights the ongoing debate about whether China merely exploits commodity and energy resources in developing countries as the old West or truly promotes national and local development through its overseas infrastructure construction and other positive means as a new global power. This debate will not be settled for a long time as we continue to scrutinize China’s powerful role in shaping the developing world during the 21st century. Xiangming Chen is the founding Dean and Director of the Center for Urban and Global Studies and Paul E. Raether Distinguished Professor of Global Urban Studies and Sociology at Trinity College, Connecticut, and a distinguished guest professor at Fudan University, Shanghai. He has published extensively on urbanization and globalization with a focus on China and Asia. His several books include Shanghai Rising: State Power and Local Transformations in a Global Megacity (University of Minnesota Press, 2009; Chinese Edition, 2009). Ivan Su is currently a third-year student at Trinity College, Connecticut, majoring in Public Policy and Law and Urban Studies. His interests are situated at the intersection of city planning, city economic development, and legal studies. He speaks fluent Mandarin and Cantonese, and carried out a field research project in the southern Chinese city of Guangzhou in summer 2014. He has been a student researcher at the Center for Urban and Global Studies at Trinity College since 2012. 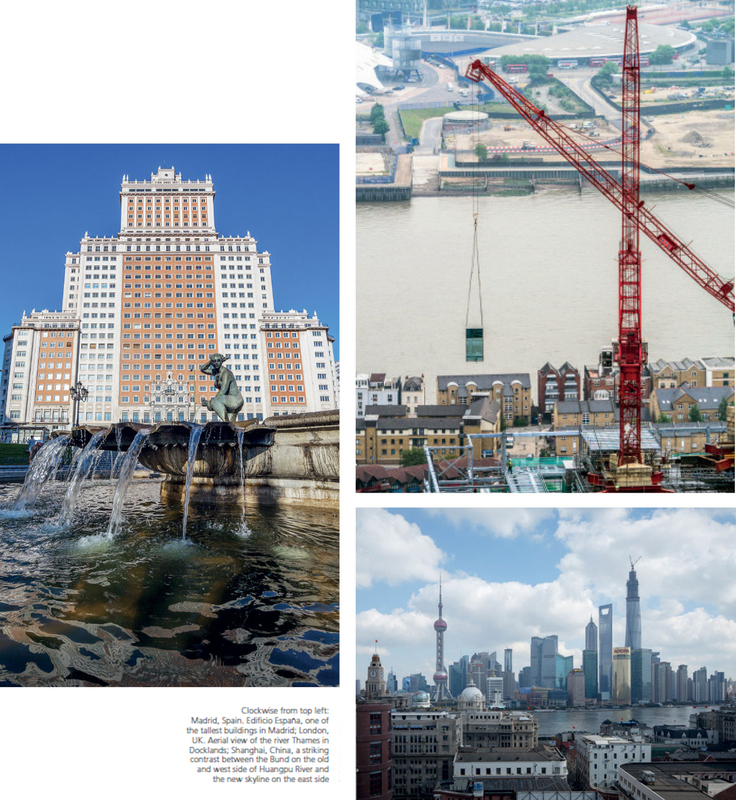 For this culminating article, we have drawn heavily from the series of articles on China and the developing world that has appeared in this magazine since the February 2013 issue. See Kayla Chen and Xiangming Chen, “China and Latin America: Connected and Competing”,The European Financial Review(February 2013): 56-58; Fakhmiddin Fazilov and Xiangming Chen, “China and Central Asia: A Significant New Energy Nexus”, The European Financial Review (April 2013): 38-43; Xiangming Chen and Curtis Stone, “China and Southeast Asia: Unbalanced Development in the Greater Mekong Subregion”, The European Financial Review (August 2013): 7-11; Xiangming Chen and Garth Myers, “China and Africa: The Crucial Urban Connection”, The European Financial Review(December 2013): 89-93; Abbᾱs Varij Kᾱzemi and Xiangming Chen, “China and the Middle East: More Than Oil”, The European Financial Review(February 2014): 40-44; and Xiangming Chen, Pallavi Banerjee, Gaurav Toor, and Ned Downie, “China and South Asia: Contention and Cooperation Between Giant Neighbours”, The European Financial Review(April 2014): 10-16. Xiangming Chen and Curtis Stone, ‘China and Southeast Asia: Unbalanced Development in the Greater Mekong Subregion’,The European Financial Review(August 2013): 7-11. ‘Malaysia and China agree to $11 billion deal to build mines, dams in Borneo’; accessed from http://news.mongabay.com/2010/0112-sarawak.html. Xiangming Chen, Pallavi Banerjee, Gaurav Toor and Ned Downie, ‘China and South Asia: Contention and Cooperation Between Giant Neighbours’,The European Financial Review(April 2014): 10-16. Xiangming Chen and Garth Myers, ‘China and Africa: The Crucial Urban Connection’,The European Financial Review(December 2013): 89-93. John C.K. 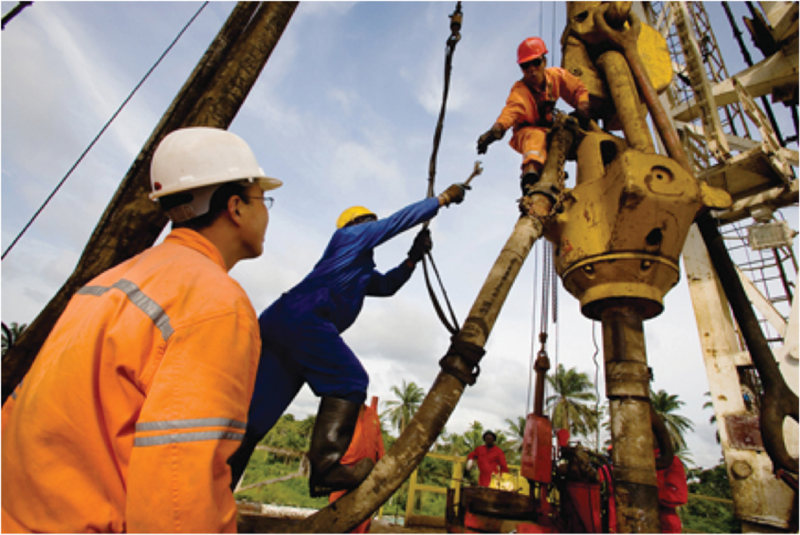 Daly, ‘China’s bold $10 Billion investment in Nigerian hydrocarbons’; accessed from http://thediplomat.com/2014/01/chinas-bold-10-billion-investment-in-nigerian-hydrocarbons. Godfrey Marawanyika, ‘China Africa Sunlight to invest $2.1 Billion in Zimbabwe Power’; accessed from http://www.bloomberg.com/news/2013-09-03/china-africa-sunlight-to-invest-2-1-billion-in-zimbabwe-power.html. Michail Vafeiadis, ‘China buying out Africa: Top five destinations of Chinese money’; accessed from http://www.csmonitor.com/World/2012/0301/China-buying-out-Africa-Top-5-destinations-of-Chinese-money. ‘Nigeria embarks on vast free trade zone with China’; accessed from http://www.reuters.com/article/2010/09/01/nigeria-china-idUSLDE67U24K20100901. Kayla Chen and Xiangming Chen, ‘China and Latin America: Connected and Competing’,The European Financial Review(February 2013): 56-58. Ze Jin, ‘China’s 21 billion investment in Brazil’s hydropower’; accessed from http://wallstreetcn.com/node/75689. ‘China’s influence in Latin America is increasing’; accessed from http://www.dw.de/chinas-influence-in-latin-america-is-increasing/a-17156409. 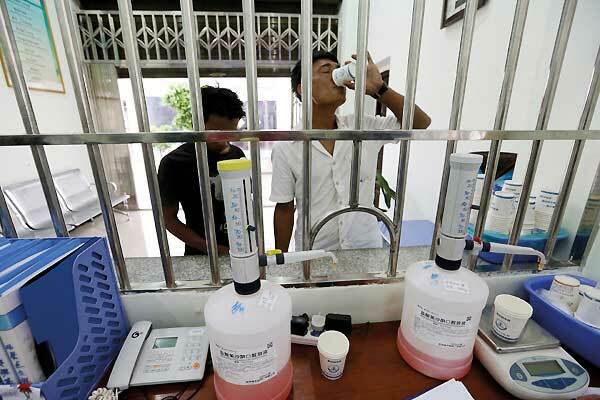 Chris Horton, ‘Giant development in Cambodia hinges on Chinese buyers’,The New York Times,May 6, 2014; accessed from http://www.nytimes.com/2014/05/07/realestate/commercial/giant-development-in-cambodia-hinges-on-chinese-buyers.html?_r=1. Kathleen Caulderwood, ‘Chinese Premier Li Keqiang vows to help build a railway through Africa ‘with no strings attached’,International Business Times,May 6, 2014; accessed from http://www.ibtimes.com/chinese-premier-li-keqiang-vows-help-build-railway-through-africa-no-strings-attached-al+African+Railway+No+Longer+A+Pipe+Dream&utm_campaign=May_09_2014_0700. Patricia Rey Mallén, ‘Is the partnership between China and Latin America paying off’?International Business Times, May 8, 2014; accessed from http://www.ibtimes.com/partnership-between-china-latin-america-paying-off?